I'm a planetarium software author (ECU) and I'd like to update it so users can do an aavso query of an object. Web-based tools for querying VSX in various ways are available to the public. The public data returned in a query transaction contains all the accumulated data for the most recent revision level for each star in the recordset, including details of all modifications made to the data, and references to support those changes. Previous revisions may also be viewed. The public interface does not include the means for modifying the data in any way, but a form for sending suggestions for modification to the Project Administrator is made available." Is there documentation for this? Also, since we keep being told: "VSP is not a planetarium program" :-), I'd like to better integrate it with one, as that is what many of us use to plan our observations. It would be really nice to click on a star in the planetarium and press a button and up comes a VSP chart. Can I bring up a VSP chart from an appropriately formatted web link? If so, where can I get the documentation? I sent you the HTTP GET Specification for VSX. 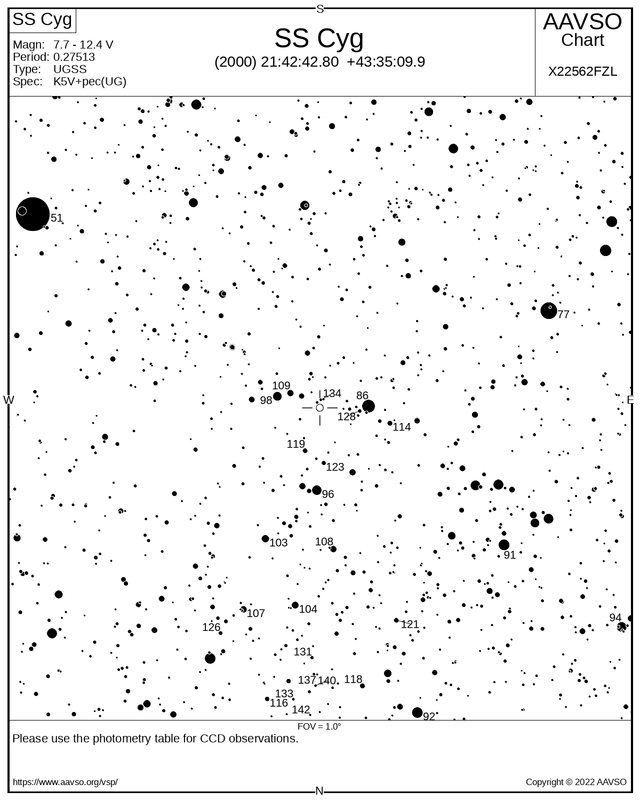 AAVSO web site and publish a specification on how to use it. especially the ones from VSX. Would it be possible to post a link here in the forum (or attach it if it's a Word doc/PDF) to the VSP HTTP GET specification? So parts might be outdated. The last time I checked all parameters, a few of the hi vs. low range values had to be reversed to get what I expected. Following this root URL, any workable combination of the below described name/value pairs may be appended. They do not need to appear in the URL in the order given here, and they do not all need to be present. Selective absence and presence of these values from the URL are what make for all the different search types. All non-numeric argument values may include the SQL wildcard character (%) in order to create wildcard searches, but the character must be URL-encoded as %25. Spaces must be URL-encoded with the whitespace replacement character (the plus sign). Plus (+) characters present in designations or coordinates must be URL-encoded as %2B. The central J2000 RA/DEC coordinates for a radius search, expressed sexagesimally (by default), or in decimal degrees if format is set to d. Northern hemisphere coordinates must have the plus (+) sign URL-encoded as %2B. Space characters between all other figures must be replaced with the URL whitespace character (+). The order argument (which see) must also be included in the query string with its value set to 9 in order to prompt VSX to display distances from the central coordinates in the results listing. Default is empty string (no radius search). Object identification for name searches. Space characters must be replaced with the URL whitespace character (+). Other special characters may also need to be URL-encoded. Default is empty string (no name search). The numeric constellation ID for constellation-bound searches. See http://www.sai.msu.su/groups/cluster/gcvs/gcvs/iii/constel.dat for codes. Default is 0 (not bounded by constellation). Explicit specification for format of coords. For sexagesimal, this value should be s. For decimal degrees, this value should be d. Default is s (sexagesimal). The geometry for central coordinate-based searches. For radius searches, this value should be r. For box searches, this value should be b. Default is r (radius search). For box searches (geom=b), the width of the box. For radius searches (geom=r), the radius of the circle. Expressed in the units specified by unit (see next). Default is 10.0. The unit of measurement used for the value given in size (see above). For arc degrees, this value should be 1. For arc minutes, this value should be 2. For arc seconds, this value should be 3. Default is 2 (arc minutes). The variability type. Used to limit search to only stars of specified variability type. Typically, this can be set to a standard GCVS variable type abbreviation (see http://www.sai.msu.su/groups/cluster/gcvs/gcvs/iii/vartype.txt), but VSX holds in its database many different non-standard variable types taken from other catalogs. Default is empty string (no limitation to variability type). The spectral type. Used to limit search to only stars of specified spectral type. Default is empty string (no limitation to spectral type). The following pairs of query string arguments are used to perform searches on values greater then, less then, or between given values. Including one value from the pair establishes only an upper or lower limit, and including both established a complete range. The upper and lower limits to a search within a range of maximum magnitudes. Defaults are empty strings. The upper and lower limits to a search within a range of minimum magnitudes. Defaults are empty strings. The upper and lower limits to a search within a range of periods. Defaults are empty strings. The upper and lower limits to a search within a range of epochs. Defaults are empty strings. The lower and upper limits to a search within a range of rise times. Defaults are empty strings. The lower and upper limits to a search within a range of outburst years. Defaults are empty strings. A comma-delimited list of the values representing which class of objects should be included in the search results. This allows for filtering in/out proven variables, suspected variables, and/or non-variables. The value for proven variables is 0, for suspected variables is 1, and for non-variables is 2. For example, if you wanted to search for only proven variables, the value should be set to 0. If you wanted to search for all classes of objects, the value should be set to 0,1,2. Defaults to 0,1 (includes proven and suspected variables, but not non-variables). Default is 1 (by GCVS name sequence). There is a limit of 9999 records that can be returned from any HTTP GET query of VSX. Thanks for the VSX http get spec Wolfgang. I'd like to remove (eventually) all direct database access to VSX, AID etc from VStar, using web services or http get. Further to this old thread, is there a way to get B1950 coordinates from a VSX get query or if these are required, should one just convert from the J2000 coordinates? A HTTP GET query in VSX will only give J2000 coordinates, but you have the B1950 coordinates if you go to the individual detail sheet of an object, by following the link provided by the result from the GET query. I meant to say that this is a VOTable query, e.g. that I want to programatically process. I don't see much use for 1950 coordinates anymore. You should probably calculate them yourself. Okay. The context is that I have code for conversion of JD to HJD using B1950 coordinates. I'm not otherwise interested in B1950. If I can find a suitable algorithm and validate it against test data for using J2000 coordinates instead for HJD conversion, I'll happily use J2000 instead. Do you have any more suitable suggestions? There are a few online HJD calculators around which work with J2000 coordinates, most with the source code available. Here are links to just a few: http://mira.aavso.org/pipermail/aavso-discussion/2009-July/033152.html, http://britastro.org/computing/applets_dt.html, http://search.cpan.org/~rcreager/Astro-Time-HJD-0.02/HJD.pm. There is now also a HTTP GET Specification for VSP on the homepage. The query mechanism works pretty well for charts. It is documented at https://www.aavso.org/vsp-api . I see from other posts you are working to port your CHARA app from VB6 to VB.Net. Big step but truly necessary as VB6 loses support. If you get good at vb.net, you can help out on VPhot which is up for revisions this year. Looking forward to porting to vb.net - just waiting on a couple (literally) of problems. Is VSX api still valid? I followed the (2011) api info in this thread but I'm not getting back xml or json data, just the html content of the index page. For XML output, use 'api.object' for the view parameter, instead of 'results.get'. For JSON output add the parameter format=json. Yes that works fine for a single star but I can't get it to work for a query that returns a list of stars. For example the following returns just an empty list. Is there something obvious I'm missing? Thanks. Nigel. Yes, api.object is intended to get information on a single object by name only. There is no specific API with JSON output to query the database in the same way as the HTTP GET query documented in comment #4, which apparently is what you want to do. Replacing view=results.get with view=query.votable as mentioned in comment #8, will give you VOTable output instead of HTML. Here is an example. Thanks again Patrick. I've not played with VOTable before (just Json) so will have to research a bit. btw is this thread the only source of detailed info on AAVSO apis? Don't want to keep wasting your time if there's more detailed documentation elsewhere. The VSX API has not been fully documented anywhere yet, I believe. There is some information about other APIs (and VOTable) here. Is there a recommended Python parser for the votable output from the VSX api? Astropy.io.votable parse and parse_single_table don't work (main problems being that the votable output doesn't specify arraysize for character fields so defaults to 1 which loses pretty much all the data). If not I guess I can write my own. For now I've constructed a simple parser that parses the VSX api results into a python list of dictionary objects. Code is provided below in case it is of interest (I don't claim it is Pythonic !). # Returns the results of a query to the AAVSO VSX API to retrieve target data. # params VSX API query parameters. Defaults to query.votable view. # returned by the VSX API. Dictionaries keyed by the VSX field id. That's great. Works a treat. <br />\n<b>Parse error</b>: syntax error, unexpected '[' in <b>/media/disk/www/vsx/query/qry_get.php</b> on line <b>73</b><br />\n"
It seemed to be working fine a couple of days ago. Has there been a change in the server code or is it something peculiar about my query? Weird, working again now. Did anything get changed?